One of the most influential pupils and followers of Shabbethai Ẓebi; lived at Leghorn in the seventeenth century. 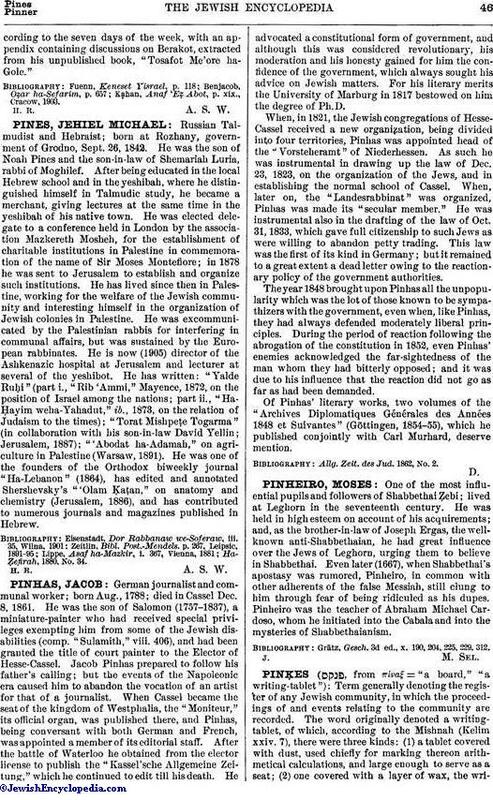 He was held in high esteem on account of his acquirements; and, as the brother-in-law of Joseph Ergas, the well-known anti-Shabbethaian, he had great influence over the Jews of Leghorn, urging them to believe in Shabbethai. Even later (1667), when Shabbethai's apostasy was rumored, Pinheiro, in common with other adherents of the false Messiah, still clung to him through fear of being ridiculed as his dupes. Pinheiro was the teacher of Abraham Michael Cardoso, whom he initiated into the Cabala and into the mysteries of Shabbethaianism. Grätz, Gesch. 3d ed., x. 190, 204, 225, 229, 312.